Health warnings on alcoholic drinks should be introduced to combat problem drinking, a parliamentary group says. The All-Party Parliamentary Group on Alcohol Misuse said labels should warn about the harmful effects of drinking. It wants political parties to commit to 10 recommendations to minimise alcohol-related problems in the UK - including cutting the drink-drive limit. 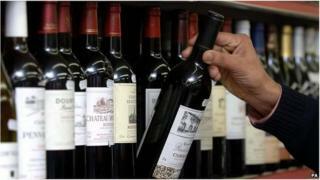 The government said it was working to reduce excessive alcohol consumption and tackle sales of cheap alcohol. The recommendation document written by the group says: "Health warnings are a familiar and prominent feature on all tobacco products. Likewise, detailed nutritional labelling is ubiquitous on food products and soft drinks. "Yet consumer information on alcohol products usually extends no further than the volume strength and unit content. "In order to inform consumers about balanced risk, every alcohol label should include an evidence-based health warning as well as describing the product's nutritional, calorific and alcohol content." Among their recommendations, the MPs call for a reduction of the drink drive limit, the strengthening of regulations surrounding alcohol marketing and the introduction of a mandatory minimum price per unit for alcohol. They also recommend a national public awareness campaign on alcohol-related issues, training for social workers, midwives and healthcare professionals and to make alcohol treatment available to 15% of problem drinkers compared with 6% currently. Conservative MP Tracey Crouch, chairwoman of the All Party Parliamentary Group on Alcohol Misuse, said: "The facts and figures of the scale of alcohol misuse in the UK speak for themselves - 1.2 million people a year are admitted to hospital due to alcohol; liver disease in those under 30 has more than doubled over the past 20 years and the cost of alcohol to the economy totals £21bn. "Getting political parties to seriously commit to these 10 measures will be a massive step in tackling the huge public health issue that alcohol is." Jackie Ballard, chief executive of Alcohol Concern told the BBC urgent action was needed to tackle the issue of alcohol misuse. Media captionAlcohol Concern's Jackie Ballard: "This is about individual education and knowledge"
She said: "Alcohol is related to about 60 different health conditions. People think about liver disease as being caused by alcohol. They don't think about increased blood pressure, increased risk of strokes, heart attacks, even cancer. "So we're talking about a major problem. The MPs in this report describe it as a pandemic." However, Sarah Hanratty, deputy chief executive of the Portman Group, which was established by the UK's leading alcohol producers to promote responsible drinking, said 80% of people drank "well within" the government's recommended guidelines. She told the BBC News Channel that "graphic" health warnings on alcohol packaging would be a "step too far". "I think there's lots of information out there for people. The industry here is doing incredible amounts of work in terms of voluntarily putting the government's guidelines on alcohol. "Just look at the back of your label and you'll see things like the number of units in there, the chief medical officer's guidelines and all sorts of other useful information out there for consumers," she said. It comes as Northern Ireland's health minister Edwin Poots says there is merit in the idea of charging fees to patients who end up in A&E as a result of alcohol or drugs. A government spokeswoman said: "We are taking action to reduce excessive alcohol consumption and to give people better information about the impact drinking can have on your health. "Through our Responsibility Deal, the drinks industry has committed to putting unit and health messages on 80% of all bottles and cans. And we have banned alcohol sales below the level of duty plus VAT to tackle the worst cases of very cheap and harmful alcohol."